He also plays Classical Guitar and Bowed Dulcimer. 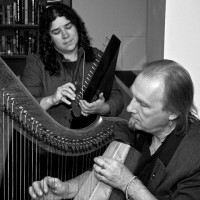 Specializing in Music from the Medieval, Renaissance and Baroque eras, as well as Celtic Airs and Ballads, Jay has also arranged modern compositions for the Harp by artists including The Beatles, Led Zeppelin and Sting. Celtic Folk Harp - Similar in sound to the Orchestral Concert Harp, but smaller and easier to transport. Suitable for Classical, Celtic and Early Music. Clairseach - This is the traditional Celtic Harp. It is strung with wire and produces a beautiful bell-like sound. This instrument is perfect for Traditional Celtic Music. Gothic Harp - This instrument is inspired by the Harps used in 15th & 16th centuries in Europe. Strung with wire, this Harp produces a rich sound suitable for Medieval, Renaissance and Baroque Music. Guitar - Jay owns 2 Classical/Spanish Guitars designed and built by Master Luthier Phillip Jackson of Wareham, MA. These instruments are strung with Nygut, a synthetic material that simulates the sound of the gut strings that were used in Early Music. These instruments are excellent for Classical, Baroque, Renaissance & Medieval Music. Dulcimer - This handmade instrument is a descendant of the French Renaissance "Epinette". It can be plucked or bowed and can be used for Celtic and Early Music. Jay's Harp playing has enhanced several Television programs including NBC's Parenthood & Parks And Recreation, Fox's Lie To Me, the HBO Series Hung and the WIGS web-series PALOMA. His fluid style and passionate playing have earned him praise from both audiences and fellow musicians alike. Jay's most recent CD is a collection of Instrumental Renaissance and Baroque Music pieces entitled TO THINE OWN HARP BE TRUE. In 2011 he released the acclaimed New Age Harp album OPENING THE HARP CHAKRA.